Romesco is a nut and red bell pepper-based sauce that originated in Catalonia, Spain, and was served with the local catch. Served with seafood, escargot, poultry, lamb, vegetables, it’s good on just about anything! 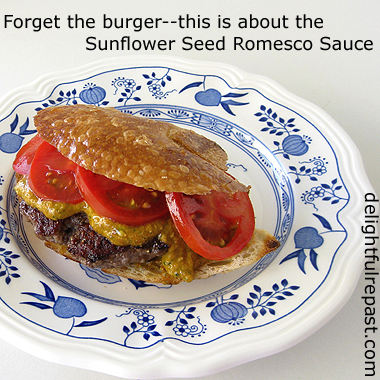 Sunflower Seed Romesco Sauce is one of less than a handful of recipes on my blog that is not my own recipe. It was sent to me by my friend Jo who just made it for a dinner party where it was a huge hit. She can’t remember where she got it, but I think it may have been Sunset magazine. Of course, I made a couple of changes. Was out of sherry vinegar, so I used red wine vinegar. Was out of flat-leaf parsley and had some cilantro I wanted to use up, so I used cilantro. I recommend it! And I changed some amounts. Oh and I left out the garlic; trust me, you won't even miss it. I used just 3 tablespoons of tomato paste, not wanting the sauce to be too tomato-y, and it wasn’t. Four tablespoons would probably be fine, too. This stuff is seriously good! Today I put it on an organic grass-fed burger. Tomorrow? Chicken, roasted potatoes, vegetables, salad, sandwiches, pasta, a dip for crudites—I might just eat it by the spoonful right out of the jar! Takes no time at all to make. I made it in my blender (Blendtec 725), but it can also be made in a food processor. Poured it into a pint jar. Now I'm wondering how well it would freeze. I'll freeze a small jar and let you know. Update 07/22/18: I thawed the frozen jar overnight in the refrigerator and tried it this morning. It was wonderful! So I'm going to make another batch today to freeze in two half-pint jars. Update 08/30/18: Just posted quick and easy Sheet Pan Chicken Dinner with Romesco Sauce. 1 Put all the ingredients in food processor or blender; process or blend until as smooth as you like it. 2 Taste and adjust seasoning. 3 Cover and chill for up to 5 days. Haven't tried it yet but am told it can be frozen for up to 3 months. Sully, the "obvious sweetener" in this is the tomato paste. Concentrated tomato is naturally quite sweet (it's a fruit, after all), so go for the 4 tablespoons of tomato paste, taste it, then add more tomato paste, if you want to. There's also a sweetness to roasted garlic, so you could add in a couple cloves of that. You must have known that I just picked up a huge bag of sunflower seeds today when I did grocery shopping. Must give this a try because I trust your taste. The sandwich looks awesome too. Angie, thank you so much! I really think you'll like it. Do let me know! Worthy indeed, Jo! I love it! I don't own a food processor so am delighted to see this can be made in a blender. What an innovative sauce! Thanks to both you and Jo. Thanks, Pauline. This sauce is going to save me through the long hot summer! This isn't a sauce I've heard of before, Jean, but it sure does sound amazing! I always like the use of vinegar in a sauce, it gives such a great flavour. The sunflower seeds would give such a great texture too. Sharing! 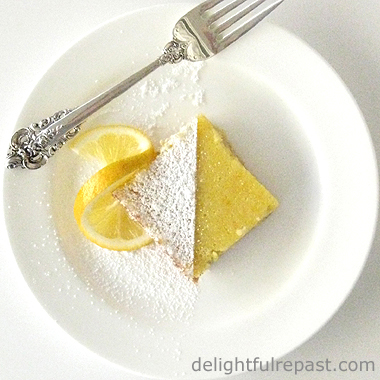 Thank you so much for bringing this delicious recipe to the Hearth and Soul Link Party. Hope you are having a lovely week! April, thank you so much. I think you'd find many uses for the Romesco throughout the summer. 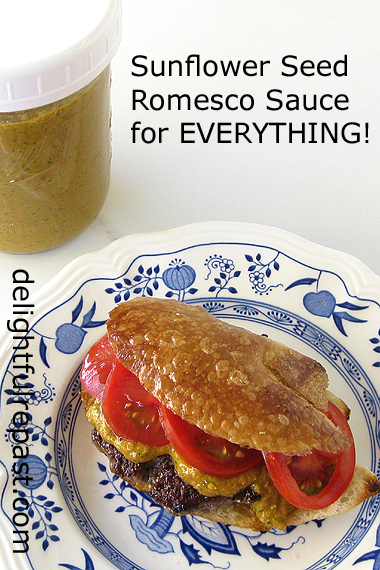 I love romesco sauce and think I will really love this one! Mostly, I have made it with walnuts but I think the subtlety of the sunflower seeds will be so much nicer! And I agree about reducing the tomato- it can overwhelm the other flavors. Finally, you know I won’t miss the garlic! Happy weekend! This sauce does sound good, but (not gonna lie) I'm putting it on meat. David, do let me know how you like it with the sunflower seeds. Funny, but I think of you whenever I delete garlic from a recipe! Thanks, Tony. Let me know how you like it. I put it on a chicken burrito yesterday, and that burrito has never tasted better! I'm somewhere in the middle on the eat-to-live/live-to-eat spectrum. My food must taste and look good AND be nutritious and all my other food requirements. Have never been willing to consume the junk that is ruining the health of so many people. I'm a sauce person so this is something I'd be game to try. I wished that I had known about this sauce when I visited Spain back in 2011 so I could have tried it there! I love romesco sauce and make it all the time. I have to try your version using sunflower seeds and cilantro. Fantastic! Margie, thank you. Yes, it would've been wonderful to have it in Spain! You can make it with almonds or walnuts, but I'm just crazy about the flavor of the toasted sunflower seeds. Let me know how you like it! Thanks, Gerlinde. I hope you will, and let me know how you like it! Oh wow dear friend! Great minds think alike, as here I was making a sunflower table with blue and white onion plates and loving sunflower seeds. I cant wait to make this recipe you shared with us. Thank you for sharing and for the wonderful comment you left me. You made my day ! Fabby, thank you so much! Yes, this is perfect for your sunflower table--I really love that table! This looks tasty, Jean. Sunflower seeds are pretty delish and all the ingredients sound like a good combo! Thanks, SIM. I try to make everything healthful as well as tasty. I always say, Nothing tastes as good as healthy feels. Jeanie, thank you. I really think your wine group would enjoy this some evening! This sounds perfect for summer! yay for no oven or stove required! Thank you, Beth! I'm going to be trying to do without the oven/stove today! What an interesting sauce, Jean. I loved the ingredients that are included in this flavorful sounding condiment. Thank you, Kitty! I can't wait to try it more things--it has been delicious on absolutely everything I've put it on so far! It looks delicious. Will have to try this. Romesco sauce is really good -- love the stuff. Haven't made any lately, and keep meaning to. And never made it with sunflower seeds -- fun idea. This looks wonderful -- thanks. Thanks, John. And do try it with cilantro instead of parsley, too. Wow! That was one happy accident! Thanks, Daydreams! It's so perfect for summer because there's no cooking, just pan toasting the sunflower seeds. Looks very tasty! So pretty! Thanks for sharing with us at the To Grandma's House we go link party! Tarah, thank you. Looking forward to seeing your latest project! I'm very fond of a little Romesco sauce now and then but sunflower seeds in the sauce is definitely a new one on me. It sounds really good and I'm all for a variation or two, although I might miss the garlic just a little. I'm always pleased to see any recipe with sherry vinegar. I think sherry vinegar can add a very different, subtle flavour to a dish and it isn't used enough. To be honest I don't use it enough. Thanks, Phil. I've got to pick up some sherry vinegar; I've been out of it for a while. I love this stuff so much I may never make it with nuts and parsley! Thanks, Jaki! I really think you'd like it. Sauce made; grass-fed ground beef bought; guests invited. Tonight's the night! Thanks, Jean! Sue, I can't wait to hear how it went over!